Plus other news, resources and events! For people with disabilities, accessible and fashionable clothing options are often limited. To simplify shopping for people with disabilities, Alexandra Connell created PATTI + RICKY, an online store that offers fashionable and functional products. PATTI + RICKY, which launched earlier this month, features products from 20 different designers, many of whom live with disabilities themselves. You can buy items like fidget jewelry, cochlear implant ear cuffs, braille imprinted products, magnetic shirts and wheelchair-friendly raincoats. Continue reading the full article at https://themighty.com/2017/07/patti-ricky-online-store-people-disabilities . 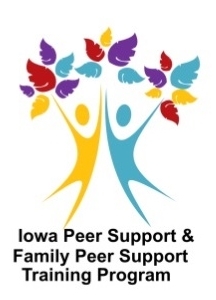 Iowa Peer & Family Peer Support Training Program is launching a new Family Peer Support Specialist training. The training includes online training prior to an in-person training experience. You must attend all four days of in-person training; class is held 8:30 to 4:30 each day. ﻿For more information on this new format, go to www.iowapeersupporttraining.org/trainings/family-peer-support-specialist-training. Do you have – or know of someone who has – a great family and school partnership for children receiving special education services and supports? The Iowa Department of Education wants to hear from you. Since there is a lack of consistent family and school partnership practices in the state, the Department is looking for promising practices – whether it’s a program, service, strategy or policy that shows potential for developing into an evidence-based practice. Promising practices can be in the early stage of implementation. Nomination and application papers will be available soon. If you have questions, please contact Kim Drew, kim.drew@iowa.gov or Deb Chiodo, deb@askresource.org . 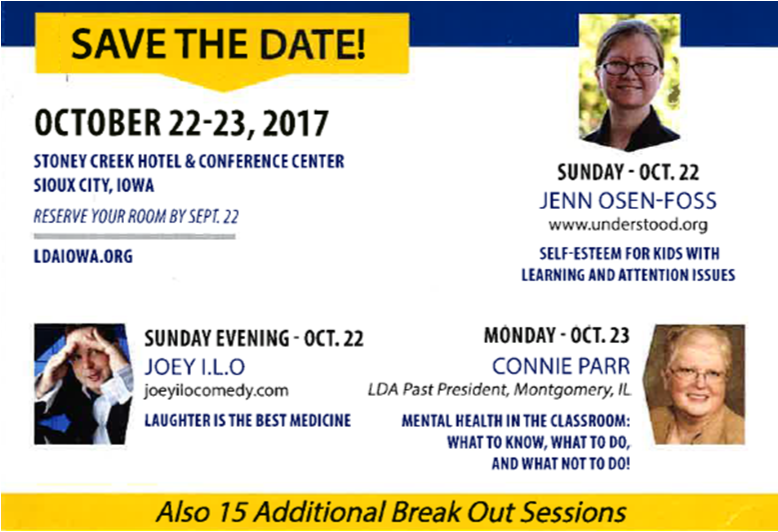 Save the Date for the 2017 LDA Iowa Conference in Sioux City! "Keep Calm: Mindfulness, Mental Health, and More!" is t he focus of the 46th annual Learning Disabilities Association of Iowa conference. Previously hosted in Des Moines, the conference will now be held in Sioux City at the Stoney Creek Hotel & Conference Center and features three keynotes and 15 breakout sessions! In mid-August, Iowa Department of Education Director Ryan Wise announced that the third draft of Iowa’s state plan for meeting the federal Every Student Succeeds Act (ESSA) is available for public review and comment. Iowa’s plan will be finalized and submitted to the U.S. Department of Education in September. Continue reading at https://www.educateiowa.gov/article/2017/08/17/third-draft-iowa-s-essa-plan-released-public-review. For people with disabilities, making a home accessible is key to promoting independence and personal choice. 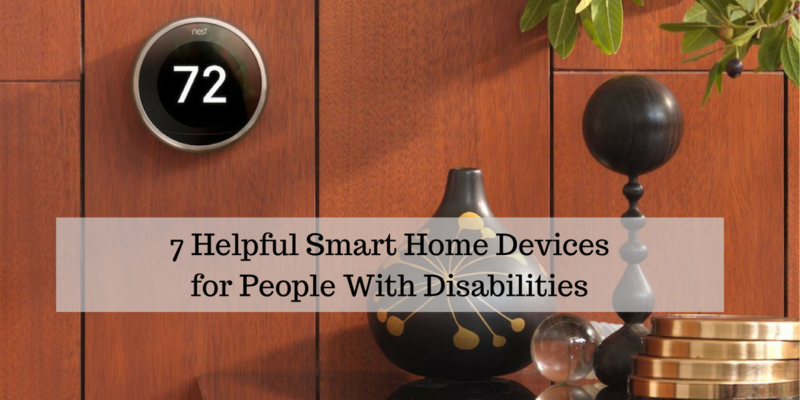 In recent years, creating a truly accessible home has become easier thanks to smart home technology. "Debunking Common Myths About Using Assistive Technology with Young Children"
Thursday, September 21 | Noon-1:00 pm | No cost! Details and registration available next week at www.askresource.org/calendar. Did someone share this email with you? Sign up for our mailing list! The contents of this listserv email were partially funded by grants from the US Dept of Education, #H328M140017, Project Officer David Emenheiser, and the US Dept of Health & Human Services, #H84MC24065, Project Officer Andrea Williams, and a grant from the Wells Fargo Foundation. These contents do not necessarily represent the policy of those entities, nor should one assume endorsement by them. ASK Resource Center serves as a Family Voices State Affiliate Organization, and is a member of the Parent to Parent USA Alliance.